purpose built student accommodation that serve students of DCU without including deposits. First year-only Larkfield Apartments on the Glasnevin campus and St Patrick’s College Campus tie for the least costly choice for incoming students at €4,572. Hampstead Apartments on the Glasnevin campus comes in as the cheapest place to live for the academic year for all other undergraduate students, with a single room and double room totalling at €4,860 and €4,932 respectively. Next-in-line is College Park Apartments which is adjacent to Hampstead, with a single room costing €5,148, a double room tallying up to €5,328 and superior accommodation priced at €5,461. 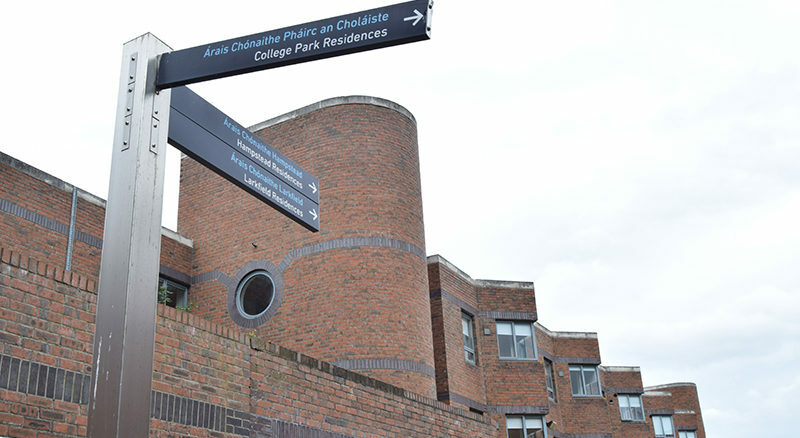 Single and double rooms at All Hallows campus mirror the prices of Hampstead and College Park, although €4,860 and €4,932 will not include an en suite to students living on the Drumcondra site, whereas €5,328 and €5,461 do. The new Broadstone Hall in Phibsborough is the most expensive of all major purpose built DCU serving student accommodation, with prices ranging from €7,200 for one spot in a twin bedroom to over €10,000 for a ‘Premium Plus Room’. A twin-room in Gateway Student Village is the cheapest purpose built alternative to on campus accommodation, costing up to €5,580 with or without an en suite. Gateway also provides a single bed room without an en suite at €6,580 and a single bed with an en suite for €6,980. Shanowen Square and Shanowen Hall are the closest privately owned student apartment complexes to the Glasnevin campus and a room would put a student back €6,165 or €6,300 respectively. Hazelwood in Northwood, Santry is managed by two separate parties, Academy Walk Property Management Maintenance & Lettings Ltd and Harrington Property Management, with the former’s cost at €6,500 for one full payment or €6,800 when paying in two instalments for the academic year and the latter amounting to just €6,300 for the same time frame. School House Court near Omni Park Shopping Centre in Santry could put a student back €7,000 euro depending on how many months a student intends on staying.